BACKSAVER AUGER Models 10", 13" and 16"
THE FARM KING BACKSAVER AUGER IS DESIGNED BY THE PEOPLE WHO KNOW AND UNDERSTAND YOUR GRAIN HANDLING NEEDS. Farm King has been manufacturing BackSaver augers for more than four decades. The same principles used back then still apply today when choosing materials that go into every auger, grade A steel and functional design. Models range in lengths of 50 to 114 feet accompanied by 10, 13 and 16-inch tube sizes. A bridge-like support system allows the auger tubing and flighting to remain stable at all times including raising and lower of the auger. 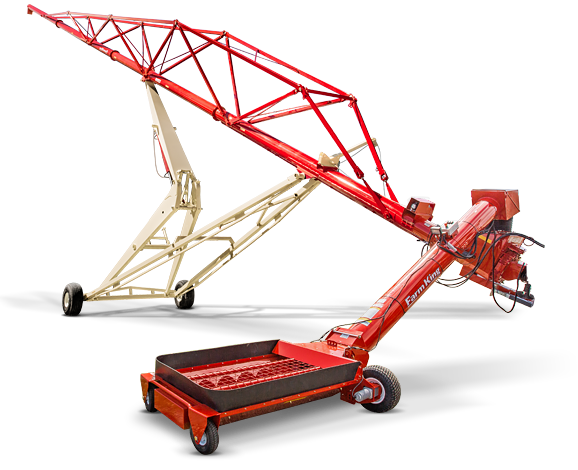 The hydraulic scissor lift resurrects the auger in virtually no time at all. When the spout is in the desired location, a safety hydraulic ball valve can be adjusted to ensure the augers stays when and where you want even in unpredictable weather. The recommended horsepower for peak operation ranges from 40-175 depending on auger size. With 10", 13" and 16" diameter tubing by up to 114' length, the operator is able to move large quantities of grain in short periods of time. 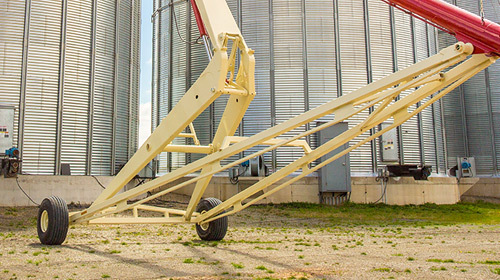 Transporting the auger has never been easier with a maximum transport height of 15'. FARM KING BACKSAVER AUGERS ARE PRACTICAL, ECONOMICAL AND DEPENDABLE. That dependability has been a benchmark of Farm King BackSaver Augers for many decades. Auger tubing sizes are available in 10" or 13" diameters and lengths ranging from 50 to 114 feet. The 43-1/2" x 60" intake hopper invites large quantities of grain to be quickly moved up the auger and into the bin. THE 16" FARM KING GRAIN AUGERS ARE DESIGNED BY THE PEOPLE WHO KNOW AND UNDERSTAND YOUR GRAIN HANDLING NEEDS. The large 16" tubing by up to 104' length allow the operator to move large quantities of grain in short periods of time. Equipped with a 3" lighting shaft, the Farm King auger handles even the dampest crops with ease. The scissor lift undercarriage, exclusive to Farm King BackSaver Augers, requires less hydraulic pressure to raise and lower the auger. The wide undercarriage is stable and solid while still meeting transport requirements. Once positioned, a shut-off valve on the underside of the auger tube limits the circulation of the hydraulics so the auger will maintain its height. The optional two spool valve allows for hydraulic operation of the intake hopper winch and the hopper mover while only using two remote valves. 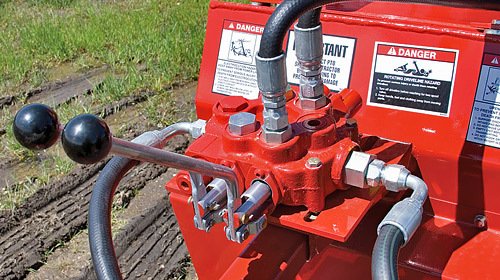 The hydraulic controls eliminate the need to operate the winch and intake hopper by hand.